If I don’t know what it is, I want to try it. I don’t want to proverbial “chew on it” or think about what it might taste like. No, I want to savor it, munch it, understand the texture, what spices are in it, and how it most likely was made. It should be in my mouth as soon as possible, for I need to know! My classmates, after attending Thai language classes for nearly 3 weeks now, tease me about the purpose of my travels. Every example the teacher asks me has to do with a talaat, raan aahaan, or kin khaw (markets, restaurants and food). Yesterday I was trying to decide between Malaysia and Vietnam for a visa run when my friend Tom gave me a sneaky side smile and asked what food I was more interested in eating. Touché Tom! He knows me too well already. Tonight as I was coming back from the gym, I was passing through the evening food stalls right outside of Chang Puak gate. There’s a woman who sometimes is there, and sometimes isn’t (and I haven’t figured out her schedule yet and it’s driving me mad!) who reportedly has some of the best desserts in Chiang Mai. I told myself when I went to the gym that I’d be “good” tonight and not eat dessert. Well, when I walked past the corner and saw her, I made a direct veer towards her cart instead of following my previously self-imposed instructions on my after dinner sweet ritual. I, shall we say, tossed my will-power into the 700 year old moat where it belonged. But realistically, how am I supposed to pass up her desserts when I have no idea when she’ll be there next? Never mind that she only takes a day or two off at a time; it’s the unknowing factor that makes me act on impulse. So I sidled up to her cart and tried to figure out which dessert(s) I wanted to buy. Sticky rice and mango? No, I needed something razzy and new. Coconut? Wait, everything has coconut in it so that’s a definite. Sticky and gooey? Yes. Brown and caramel-y? Sure. I pointed to a khanom (sweet snack) and she dropped two in a bag. I only wanted one, but who was I to protest? After plopping a 10 Baht coin in her hand, I was on my way back to my hotel, giddy as a girl who knows there are garbage pail kid cards in her mom’s purse, and if she’s good, she’s going to get a few. Maybe even with a piece of bazooka bubble gum! Yep, I nearly skipped home. I sat down at my table and ate my som tam laos and banana flower soup like a responsible adult does, even though all I really wanted was dessert. 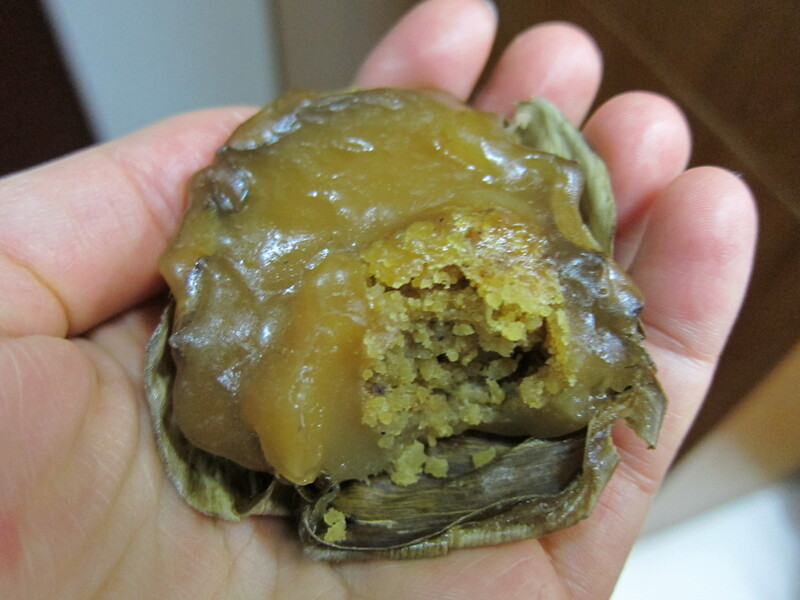 I gave one khanom to the receptionist guy and took the other one into my room to savor it. I bit in, readying my eyes to roll back, expecting a chewy sweet, brown sugary sensation to fill my mouth. Um…what is this…something dry, crumbly and mealy? Not exactly what I was hoping for– it wasn’t really that sweet. Actually, it leaned more towards the saltier side, the wrong side that my sweet tooth was rooting for. I’m usually quite excited about discovering something new and interesting, and not to say that it wasn’t interesting, but I truly had a hankering for an ultra sweet dessert, and this was far from delivering. Alas, I still ate it…! But my sweet tooth still wants gooey, sticky and perhaps even cavity inducing sweetness. I guess I’ll have to wait ’til tomorrow and cross my fingers that the famed dessert lady will actually be manning her post. And hopefully I’ll choose something a bit more up my alley this time. A girl can only dream. Next Post How Do You Like Them Appens?